Also known as “The Three E's” (spelling). 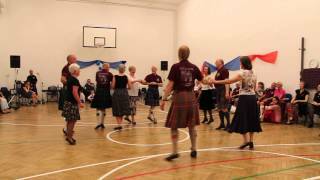 The dance derives its name from the theme of the Budapest Scottish Dance Weekend, 24-26 April 2015. The “three Es” are Enthusiasm, Experience & Excellence, which also represent the trio of organisers: Ágnes, Zsófia & Laura. 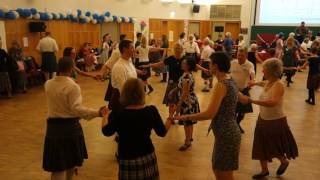 The dance is dedicated to the Budapest Scottish Dance Club with many thanks and great affection for their wonderful hospitality and happy dancing. In the “Teapot Chain” the first wheel (or “teapot”) is done with the Head Couple positions and the second one with the Side Couple positions. At the end of this figure, the outside couples finish in the place opposite where they started while the middle couple returns to the centre of the set. This figure was devised at the Budapest Scottish Dance Weekend in 2013 (using the pink & blue tops from bottles of water!) for a dance I was asked to write for a 50th birthday celebration. I thought it would be nice to use it again in a dance for Budapest. Added on: June 19, 2015, 11:39 p.m.
Added on: May 10, 2017, 3:40 p.m.
Budapest Local Club 28.03.2017 2017-03-28 Zsofia Jozsef April 6, 2017, 5:45 p.m.
Budapest Local Club 27.04.2017 2017-04-27 Zoltán Gräff April 27, 2017, 9:41 p.m.
Budapest Local Club 13.04.2017 2017-04-13 lldikó Szakolczai April 13, 2017, 10:31 p.m.
Budapest Local Club 02.05.2017 2017-05-02 Zsofia Jozsef May 3, 2017, 1:51 p.m.